Do you ever watch one of those cooking competitions on TV? I love them! Have you ever noticed that there is always one chef who either comes up with insanely long names for their dishes or for every course has some vegetable “3 ways”? It always cracks me up. 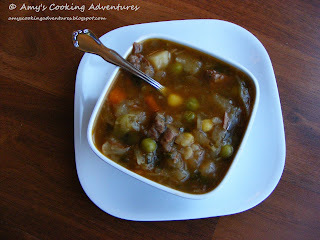 When I made this vegetable soup, my husband and I were inspired by there overachieving chefs. 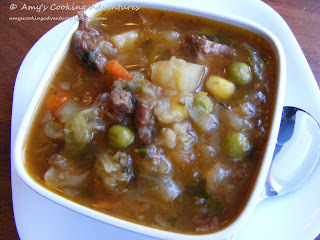 And so, I Cleaned Out my Freezer Beef & Vegetable Soup with Carrots 3 Ways was born. The “cleaned out my freezer” part is pretty self explanatory. I had a whole bunch of bags of frozen vegetables with just a handful left. They were cluttering my freezer and at risk of getting freezer burnt, so instead of throwing them out, I threw them all in the soup. So, carrots 3 ways: diced, coins, and shredded. Overall, this was a delicious and hearty soup that reminded me of one of my favorite canned soups (but so much better). This makes a very large pot of soup, so expect some leftovers or feed a crowd! Like most soups, this is just as good, if not better the second day. To begin the broth, heat the oil in a large soup pot. Season the steaks with salt and pepper and cook until browned on both sides, about 8 minutes. Add the chicken broth, beef broth and water and scrape and “gunk” off the bottom of the pan. Cut the top 1/3 off the head of garlic and remove any loose skins from the outside. Add the garlic, onion, bay leaves, and thyme. Bring to a boil. Using a shallow spoon, skim off and discard any foam or fat that rises to the surface. Reduce the heat to medium low and simmer until the meat is tender, about 2 hours. Transfer steaks and garlic to a plate to cool. Remove and discard bay leaves and sprigs of thyme. When cool enough to handle, cut the beef into bite sized pieces. Squeeze the garlic cloves onto a plate and mash with a fork. Add the beef and the garlic paste back into the pot. Stir all the vegetables (frozen or thawed), and V8 into the pot. Bring to a boil and simmer for 30 minutes or until the vegetables are tender.